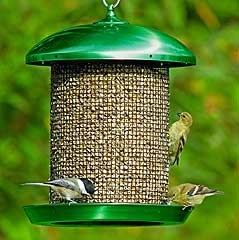 2.5 inches in diameter 23 inch long tube 6 port sunflower feeder. Sales ready. Fully assembled. Green. Features 3/4 in. native white pine, stained with non-toxic brown stain, stainless steel hardware, easy-to-clean glass hopper panels. 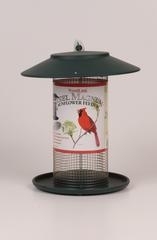 Fill large 4 quart capacity with premium Feathered Friend wild bird food mixes or sunflower products. Birds can feed from both sides. Easy open top for quick filling. Includes 2 eyes to hang or pole mount for stability. Size is 10.09 in. high x 16.01 in. wide x 9.98 in. deep. Made of over 90% recycled plastics. Our recycled plastic doesn't absorb water so it won't harbor mold or bacteria. 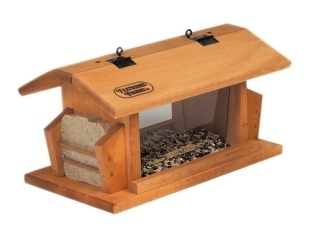 Includes 2 suet holders. Holds 5 pounds of seed. All Steel Hunter Green Top, Bottom With Black Metal Screen. Easy-Open Top. Fully Assembled. Fill With Black Oil Sunflower. This 4 qt. 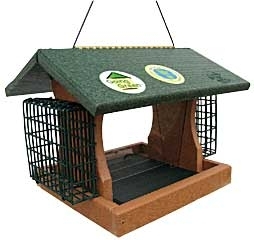 Magnum Sunflower Feeder is built to survive the elements of nature and provide years of enjoyment. 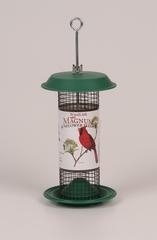 Magnum feeders attract and feed more birds than any other feeder of comparable size. Wide mouth design offers Easy Fill to reduce or eliminate spillage. Large rounded perch lets birds stand to the sides or front to better watch for predators while feeding. 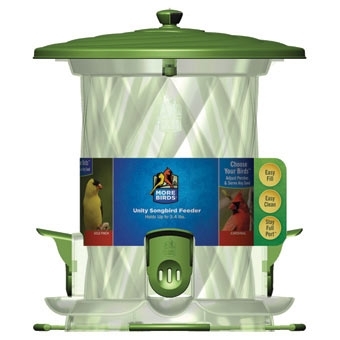 Four feeding stations accommodate Nyjer, sunflower or mixed seed. Allocates seed evenly to all four ports. Holds up to 3.4lbs of seed. The green original No/No holds 3 pounds of black oil sunflower seeds and attracts clinging and perching birds. Just hang, fill and enjoy this preassembled feeder and watch the bird show. This unique feeder stands 21 inches tall to feed 15-20 birds at a time, and features a trough base. Comes in a black and terra cotta finish. Patented baffle design helps retain feed in upper tiers until the feeder is virtually empty. Feeder is easy to fill and can hold up to 6-7 lbs. seed. The all-metal construction is durable and is powder-coated in a beautiful weathered bronze finish. Feeder comes with a large hanging ring. Unique seed diverter design helps move seed to feeding areas and keeps your hungry birds happy. 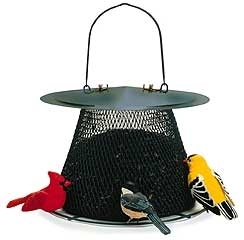 This inexpensive feeder is made of all metal and comes ready to hang fill and enjoy. Top is green in color and basket is painted a wonderful yellow. It holds over 3 pounds of black oil sunflower seeds and makes a beautiful gift. Bird Feeder is easy to clean and fill. Internal seed baffle ensures feeder empties completely, wire mesh design keeps seed level visible, holes keep seed fresh and dry. Use it to dispense 6 pounds of cracked corn, peanut chunks, safflower seeds, and sunflower seeds . 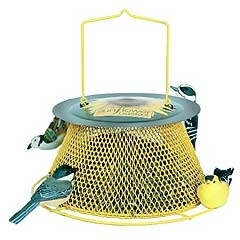 2.5 inches in diameter 15 inch tube 4 port sunflower feeder. Sales ready. Fully assembled. Burgundy. 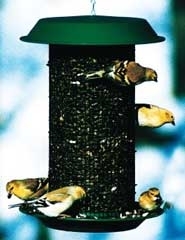 2.5 inches in diameter 23 inch long tube 6 port sunflower feeder. Sales ready. Fully assembled. Burgundy.